Blowout Sale! Save 56% on the Bellemain Heavy Duty Aluminum Half Sheet Pan, 18'' x 13'' x 1'' by Bellemain at Baking Love. MPN: 1. Hurry! Limited time offer. Offer valid only while supplies last. Won't Burn The Bottoms Of Your Baked Goods! With thin or dark aluminum pans, the bottoms of you cookies and rolls can come out burned or singed. EXTRA-THICK ALUMINUM STANDS UP TO YEARS OF HEAVY USE: A thick sheet of high-quality aluminum means you can count on even baking, something Bellemain insists on. Heats evenly and won't warp. COMMERCIAL QUALITY FOR THE HOME COOK: Professionals rely on this kind of quality, which makes it a natural choice for the serious home cook who appreciates reliability and excellence. REINFORCED ROLLED ENCAPSULATED STEEL RIM PREVENTS WARPING: The raised 1" lip on all 4 sides is reinforced to ensure your sheet pan won't warp when removing it from a hot oven, the way flimsy pans do. HIGH-QUALITY ALUMINUM WILL NOT RUST: Go ahead! Wash this pan by hand as much as you like. 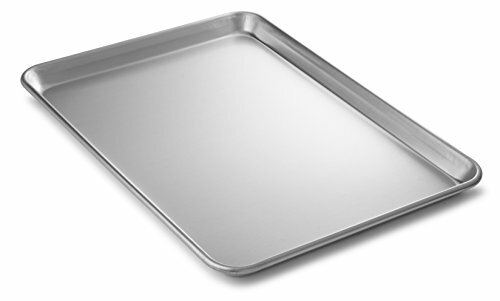 Unlike thin, cheap pans, the Bellemain Heavy Duty Aluminum Sheet Pan doesn't rust. NO NEED TO REPLACE YOUR BAKING SHEETS EVERY FEW MONTHS: The Bellemain Heavy Duty Sheet Pan is crafted from superior aluminum and made to last for years to come.